The change in aggregate energy intensity was affected by other factors such as structural changes and fluctuation in weather. We applied decomposition techniques to separate the effects of these factors on aggregate energy intensity. More specifically, our decomposition identified four main categories affecting energy use: activity, structural changes, intensity, and weather effects.5 Activity was specified as the number of households. Structural changes were the shifts in the mix of housing types, the regional distribution of households, and the average floor space per household. Intensity was the ratio of energy consumption to square foot of living area, and weather reflected energy impacts related to heating- and cooling-season weather variability (Hojjati and Wade, 2012). 1RECS is most recently available for the year 2009. 2The Btu value of energy at the point of delivery to the home, building, or establishment, is referred to as "delivered" or "site" energy. It does not include losses that occur in the generation, transmission, and distribution of energy. 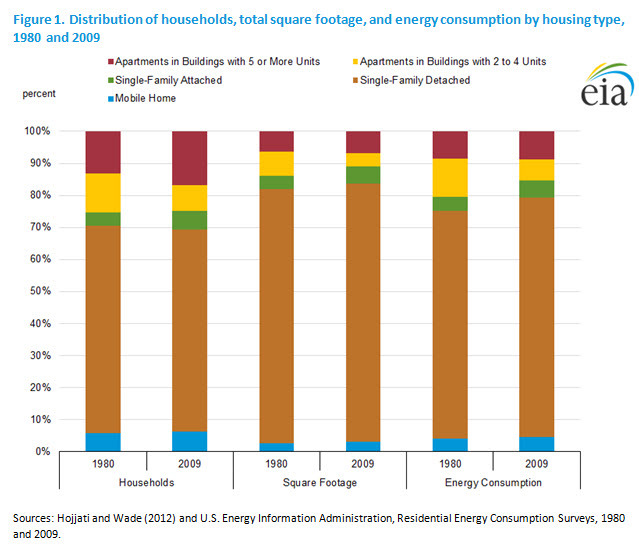 The analysis of energy consumption in this paper is based on "site" energy consumption. 3Total floor space includes attached garages, basements, and finished heated/cooled attics. 4All reported percentage changes are logarithmic to be consistent with the decomposition of energy changes into separate effects. 5Factors such as conservation effort and consumer responses to change in energy prices may also influence changes in energy intensity. These additional factors are not considered in the decomposition analysis.